Eutech’s CyberScan DO 1500 is designed for optimal performance and versatility, while preserving Eutech’s signature user-friendly qualities. Self-diagnostic, intuitive with advance set-up options for user-customisation, the CyberScan DO 1500 features BOD testing capabilities and comes with bi-directional RS232 interface for seamless data transfer to your computer or printer. 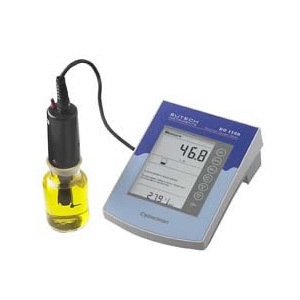 This meter is designed to provide all the information necessary to guide the user through the process of measuring dissolved oxygen with a series of prompts on the screen. The CyberScan DO 1500 provides microprocessor precision in a compact benchtop design that's easy to use. Seven function keys control all procedures. It all adds up to rapid, completely automatic, intuitive operation.